Created in 1972 Pitti Uomo is held in Florence twice a year and our editor James Phillips was personally invited by Pitti Imagine to spend a day at this world renowned event that is a firm favourite for Instagram fashion bloggers and influencers from around the world. 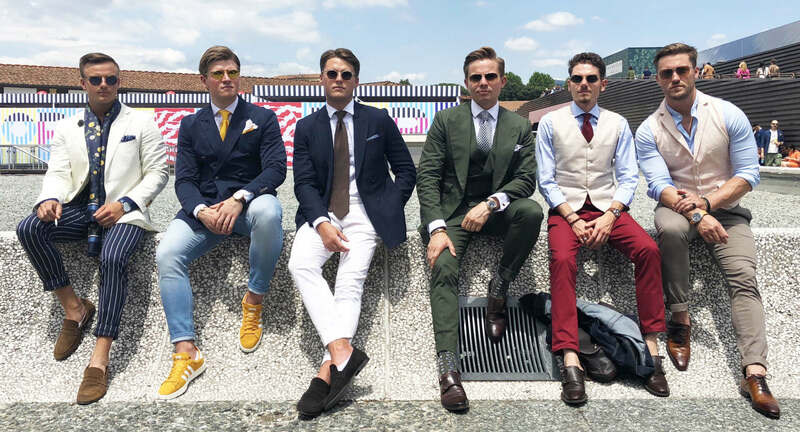 Nestled in the heart of beautiful Florence, Pitti Uomo is a week-long trade event held twice a year at the Fortezza da Basso for everything imaginable in the world of men’s fashion. Not only that, it has become the go-to event for international mens fashion bloggers, influencers to pose and ‘be seen’ and those looking to make buying decisions for retail and a great opportunity to view next seasons collections. Spread over a large area, in several different buildings this is a mecca for mens fashion lovers, but there is a much happening outside as there is in, the famous wall where influences sit to be seen and to walk around, network and socialise with like-minded people. Inside you have various halls exhibiting literally hundreds of trade stands with everything from tie pins to shoes, bespoke suits, formal shoes, to sportswear, trainers and ski-wear. With beautiful Florence just outside, there are a wealth of things to see and do and clothes shops to visit and to spend your money in! My top tips for visiting Pitti if this is your first time is to go along on the Tuesday and Wednesday, arrive early as it gets very busy and pre-book your tickets. It can get very hot in Florence so go prepared for hot weather and wear comfortable shoes. You can’t actually buy products or clothes on show as the stands are a showcase for the manufacturers, so to satisfy your need for Italian fashion, go along to the city centre where you appetite for fashion will be satisfied! A big thank you to Pitti Imagine for inviting Luxury Life International to Pitti and thank you to Cris Egger for introducing us, we look forward to next year!